It is abundantly clear that the Eurovision Song Contest is an event not to be taken too seriously. For both the audience and the performers, this annual extravaganza is primarily about one thing: fun. And so it proved with the UK leg of the Eurovision Winners Party at Scala on Saturday night. As our free glasses of cider began to fill up, so – thankfully – did the club. The show was opened by Nicki French, who carried out the roles of singer and mistress of ceremonies. She told us that her role was “totally improvised” due to last minute confusion over the order of performance. But Nicki never let it show, as she continued to rattle off humorous Eurovision trivia throughout. Sonia (also tipsy) followed, with cheery renditions of old hits, which she mainly left to the audience to sing, as she strutted joyously across the stage. Next up were Bucks Fizz who, despite their name, did not appear as drunk as the prior performers. Their members may have changed over the years, but their dance routine was largely the same: a 1981 hand-jive followed by the obligatory removal of skirts. Despite their odes to the past, however, Bucks Fizz’s own Cheryl Baker insisted she “wouldn’t touch Eurovision again with a barge pole. I mean, after winning, the only way is down”, she told us. Understandable, especially when juxtaposed with Nicki French’s statement (whose only finish was 16th in the 2000 competition). “I’d kill to do it again”, she emphatically declared. 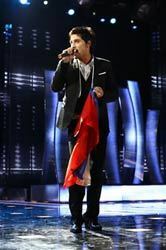 To a chorus of both boos and cheers, the 2008 Eurovision Winner, Dima Bilan, confidently performed his winning song ‘Believe’ (we suspect some of the audience were still smarting from the so-called political voting). Then, receiving the loudest cheer of the night, runner-up Ani Lorak belted out Tina Turner’s ‘Simply the Best’, followed inevitably by her Eurovision hit ‘Shady Lady’. From the performers to the audience, fun was seemingly had by all. For Mike Nolan from Bucks Fizz, “it was just as enjoyable performing now as it was 27 years ago”, while newcomer Ani Lorak said she “really loved performing in front of such a great audience”. Image of Dima Bilan, Eurovision 2008 winner, courtesy of UK Eurovision winners party website.